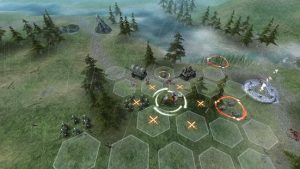 Hex Commander is a turn-based strategy game that will put you right in the middle of conflict between humans, orcs, goblins, elves and dwarves. Build a mighty army and lead your troops to victory, using unique skills of your units. Make use of terrain covers and buildings to upgrade your statistics and outwit your enemies. In the human campaign you assume the role of Percival Kent, a seasoned paladin who has been sent by the Emperor to investigate reports of goblin activity in a human settlement. The kingdom is at the brink of war… Who wants it to break out? What kind of alliance will you have to forge to face the inevitable invasion of the green-skinned foes? Take part in the exciting campaign to get to the bottom of truth and protect your people. To gain a tactical advantage you must resort to magic, which goes way beyond deploying specialized mage units. As a paladin, Percival is trained to use scrolls, which can turn the tide of battle in the blink of an eye. Summon the undead, lead your opponents into a rain of fire or a toxic cloud, and awaken their rage. Thanks to the Emperor, you have a base at your disposal. You can expand it according to your preferred fighting style. Upgrade your hero and your favorite units, and improve teleports to gain an edge on the battlefield. Turn-based strategy game with simple and clear rules and a tactical depth, thanks to which you can adjust the gameplay style to your individual preferences. Use the special skills of your hero and units to gain an edge on the battlefield. Expand your base, upgrade your army and recruit specialized units. Each of the available races has well-balanced units and features, which enforce a unique strategy and make the battles more exciting and varied. Complete the captivating campaign to learn the truth behind the war that will change your kingdom forever. Amazzing game, it has a pretty good potential to become one of the best strategy games on the PlayStore. Don’t forget to keep updating the game as fast as you can, adding new things, fixing bugs and performance etc. You could also add more game modes like ” Survival” where you need to survive until your last mand standing and with every wave of enemy completed your reward will be increased. Also, I think that i’d be good if you add more units and stuff, giving it more ” Rp” bein able to select, for example, different kind of weapons for a soldier class etc, also adding more features to your “Base”. Keep it up guys. I basically like the game, well the tutorial part that I can play. Cavalry tutorial freezes at the beginning, please fix and get 5 stars! Problem solved thank you. Please restart the game. The new texts will be downloaded and this problem should be fixed. I need another update. I absolutely love this game and multiple others made by the same people. But I need more content. I beat the new missions in the update the same day it was available. And for anybody that happens to read this. The kerrash hill bug is fixable by defeating all but atleast one enemy soldiers first and then the generals. You have to trigger the dialogue of defeating the generals before killing the last enemy unit.